Clear Lake is a beautiful resort town in Riding Mountain National Park in Manitoba, Canada which becomes filled with holidaymakers during the summer months. During the summer, Clear Lake becomes fairly busy with holidaymakers who come here to enjoy the beauty of Riding Mountain National Park in Manitoba, Canada. Some people flock to the beach where swimming, tanning and playing are popular while other holidaymakers venture out onto the water in their boats for skiing, wakeboarding, fishing, canoeing or kayaking. Many visitors to Clear Lake leave the boats docked along the wharves while they enjoy the other pleasures of the town. Charming shops, elegant restaurants, campgrounds and an art gallery are a few of the highlights of this small resort town. 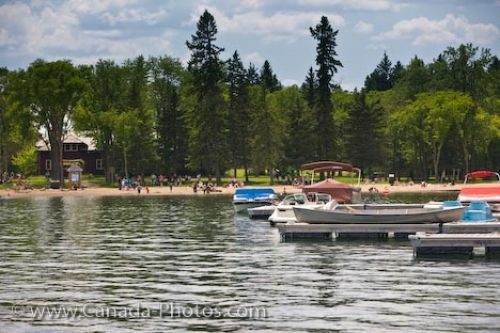 Holidaymakers relaxing on the sandy beach of Clear Lake in Wasagaming, Riding Mountain National Park, Manitoba, Canada. Picture of holidaymakers enjoying a summer day at Clear Lake in Riding Mountain National Park in Manitoba, Canada.